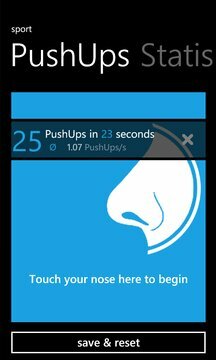 This app counts how many pushups you are doing (by touching your phone with your nose). Don't forget to wipe your display after using ;-) Now included the 100 Pushups training programm. Within 6 weeks you will be able to do 100 pushups at once. v 1.1 Added many statistics and graphs. If you want anything special, just leave a review. 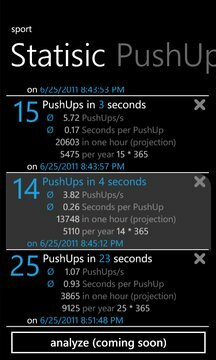 v 1.2 Removed some bugs, added trial version, started working on 100 pushups v 2.0 100 Pushups added It supports English and German.